For quite some time, I had heard people talking about Greek yogurt. I have to admit, I did not really understand the hype. I saw that it was quite a but more expensive than the regular yogurt and did not have as many options. Sometime last year, I finally saw the light and looked at the only Greek yogurt that was at our local store. Looking at the label, I quickly realized the powerful punch that it contains. My little guy is a VERY picky eater. He does not like most chicken, meat, or fish. He will tolerate yogurt, so this was a perfect way to get more protein into his diet. He loved Greek Yogurt, and so do I. When MyBlogSpark asked us to try the new Yoplait Greek Yogurt, we agreed. While shopping, I had seen it and was curious about how it compared to the brand we usually bought (Chobani). 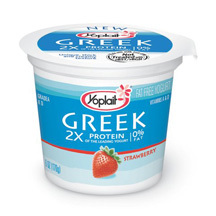 Each 6 ounce serving of Yoplait Greek Yogurt contains 12 grams of protein. Yoplait makes Strawberry, Blueberry, Honey Vanilla and Plain Greek Yogurt at this time. Complete nutritional information can be found here. The Yoplait Greek Yogurt has no fat, 15% vitamin A, 20% Vitamin D, and 30% Calcium (based on Daily Recommended Values). Yoplait Greek Yogurt has a website with more information about each of the flavors. In addition to this, they also have a variety of recipe suggestions for using their product in. They include smoothies, dill yogurt dip, fresh apple streusel pecan cake and more. While there, be sure to print out a coupon to try some Yoplait Greek Yogurt for yourself. As I said before, I am a big fan of Greek Yogurt. On a whole, I really like the thick nature of the yogurt and the much higher protein content. When I opened up a container of the Blueberry Yoplait Greek Yogurt, the first item I noticed was there was no need to mix it. Unlike the other brand that I have had, where fruit is on the bottom, this had blueberry throughout the yogurt and was immediately ready to eat. I really liked this, especially since I had two little boys eager for taste testing. The boys really liked what they tasted and each asked for another spoon before running off to play. I like the thick custard-like consistancy of the Yoplait Greek Yogurt. It was really smooth and not gritty. Since the fruit was already mixed in, there was a nice blend of the yogurt and never spots without fruit. I also liked that it was not overly sweet since a lot of fruit yogurts can have that tendency. I would definitely consider buying more of this yogurt for my family and only hope that more flavors are available soon. Thanks to MyBlogSpark and Yoplait, one lucky reader will win a Yoplait Greek "Nourish Your Inner Goddess" gift pack like the one I received below. Two coupons for free Yoplait Greek Yogurt are included along with items to help you relax. Please note, the coupons for free cup of Yoplait Greek Yogurt are not valid in some states, including California, Idaho, Louisiana, Minnesota, New Jersey, North Dakota, and Tennessee. MAIN RULE – Answer the following questions: Which flavor of Yoplait Greek yogurt would you like to try the most? 1 Bonus Entry – What is something that you do for yourself to help your inner Goddess come out? To enter, please follow the rules above within the comment section. Contest starts today April 26 and ends at 10:59 EST on May 10, 2010. You do not have to be a blogger to enter, but must leave a valid e-mail address for me to contact you for mailing address once the giveaway is over. I will select the winner using random.org and contact you via e-mail. You will have 48 hours to claim the prize. If there is no response, another winner will be selected. Open to U.S. residents only. .-= Lisanne´s last blog ..Bullet points =-. Ooh, a friend turned me on to Greek yogurt just last year. It’s great. I’d like to try the vanilla, but I’m sure the strawberry is pretty awesome too. I can’t say I truly feel like a goddess, but a shower and a home pedicure do make me feel pretty darn good. .-= Holly at Tropic of Mom´s last blog ..Tropic of Mom’s Not-Too-Short Strawberry Shortcake =-. I love vanilla yogurt and adore Greek style yogurt because i like the thick custardy texture. This one sounds delightful. I read and write to help release my inner goddess. .-= Not So Average Mama´s last blog ..Wordless Wednesday, Photography is Dangerous =-. I’d love to try the strawberry banana! .-= Lisa @ Simplified Saving´s last blog ..Sally Beauty Supply: Sally Girl Nail Polish Only $.49 Shipped =-. I exercise 5 or 6 days a week to make my inner goddess come out! And I feel so much better when I’m done! I would love to try the honey vanilla. We discovered Greek yogurt about a year ago and are huge fans. Haven’t tried the Yoplait yet, though. I think the Honey Vanilla sounds yummy. .-= Sarah – PS Mom Reviews´s last blog ..Bob the Builder: Heavy Duty Diggers DVD Review =-. For my Inner Goddess I make sure to take a little time for me. Quiet time, a bath, painting my toenails, etc. I have your button #3. .-= Noreen ´s last blog ..Disneyland: Day Two =-. .-= Noreen´s last blog ..Disneyland: Day Two =-. I love greek yogurt, and I’m particularly fond of the honey flavors. .-= Lynn C´s last blog ..Gravitational Absolutist =-. I would love to try the Honey Vanilla Yogurt. I love vanilla. To let my inner goddess come out, I like to take a long, steamy shower with good smelling body wash.
My favorite is the Strawberry! I like to work in my garden, getting my hands in the soil, growing something releases my inner goddess! Thanks to everyone that entered the Yoplait Greek Yogurt Giveaway. The comments are now closed. The winner will be selected by Random.org and announced soon.